Arun Khetarpal was born on 14th October, 1950. He was one of the bravest officer of the Indian Army. Arun comes from the family of people who have served the nation. Arun achieved a lot of respect for his remarkable and extra-ordinary service in the Indian Army. Arun lost his life while fighting a battle for his country. He is among the most influential people in the Indian Army. Arun is the recipient of the Param Vir Chakra for his amazing and braveness in the Battlefield of Basantar. Arun Khetarpal was born in Pune, Maharashtra to Lt. Col M.L. Khetarpal. His father was also an officer in the Indian Army serving as the Corps of Engineers. His great-grandfather and grandfather served in the Sikh Army and British Army respectively. Arun Khetarpal went to the prominent Lawrence School of Sanawar. Arun was not just amazing in studies but was also an outstanding sportsperson. In 1967, he joined the (NDA) National Defense Academy. Arun then in joined the Indian Military Academy. Arun was appointed into The Poona Horse on June 13, 1971. In the year 1967, Second Lieutenant, Arun Khetarpal was admitted into the 38th Course National Defence Academy and then he joined the Indian Military Academy. Arun was the member of the Foxtrot Squadron and he became the Squadron Cadet Captain of the Course 38th. In the year 1971, he was recruited into the 17 Poona Horse. In December 1971, Arun with elegant ethics was instructed to march with his force towards Shakargarh sector while he was experiencing Young Officers Course in Ahmednagar. He was positioned on duty while handling the command of squadron, when the 2nd squadron required assistance to face the armed forces of the rivals on the battle field. Arun himself was on his tank in this journey. Arun’s tank reached at the target and there was a fire. He was commanded to leave the tank and separate. But he knew that his presence was so necessary to keep the rival in check. This brave step did not permit helped him demolisha tank of rivals that was placed over 100 meters away. The brave step made by Arun saved our troops from the rivals. Arun’s dedication and love for the nation lead to the martyr of this brave soul. Arun Khetarpal has been felicitated and honored with the highest military decoration valor and courage of India in the face of the enemy – The Param Vir Chakra. Indian Military Academy’s building has been named after this brave valiant soldier. The Khetarpal ground in the NDA has also been named to give a tribute to the person who stood for the nation. The Centurion of Arun Khetarpal was known as Jx 202. It was restated after the war. The Centurion is preserved in the Armored Corps Centre. Arun Khetarpal is among the most respected and esteemed personalities in the Indian Army. Arun displayed out-standing leadership qualities, standards and determination of motive during the war. His act of bravery and self-denial has earned him a place that no one can replace in the history of Indian Army. The brave act of 2nd Lt. Arun Khetarpal’s bravery proved that nation comes first for the people serving in Indian Army. He was the youngest soldier to have been felicitated with the Param Vir Chakra. 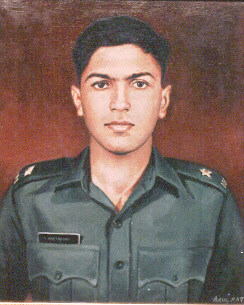 Arun earned a tribute after dedicating his life for the country. He was the bravest officer of the Indian Army. People respect and are inspired by him for what he did.